I love these cookies. They taste almost homemade, buttery and sweet. Better still they are Australian and come in a chocolate coated version as well. Yum!!! 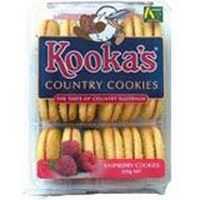 Kookas Country Cookies Established in 1994 are a great Aussie Biccie Company. These delicious cookies are so home-style tasting you would be forgiven thinking your gran baked them. Yummy crunchy bic with divine raspberry jam and made with all Australian biscuit flour, Jam, raw products and Australian produced packaging. Perfect in my eyes …oopps mouth. Wow these biscuits are soooo sweet. But they are also very tasty. These biscuits practically melt in your mouth and leave you always wanting more. Kookas Country jam cookies are a lovely biscuit to have with a coffee,l love a change from chocolate biscuits and these a favourite at work! Love these cookies! They taste like the old fashioned homemade ones which is rare these days. The jam is really nice, nice amount and the biscuit is perfect. Its also great to be able to buy such quality in the supermarket. Just like homemade. These biscuits are just the best. The biscuit part is delicious in itself, not too hard but perfectly smooth. The jam centre is sweet, but they have a perfect amount to balance out the biscuit. Highly recommend if you haven’t tried them yet. How would you rate Kookas Country Cookies Jam?